The Experimental Grid trials were conducted with the offshore sector where differences exist compared to inshore vessels in a greater amount of catch volumes over a short period of towing time. This requires maximum surface area in the grid in order to sieve the maximum amount of shrimps to the codend and reduce blockages and escapes, which means lost income for the fishermen. The prototype grid was unique in design utilising new materials, which have a direct impact on weight, which has a direct bearing on crew safety on deck in bad weather. There have been instances when conventional steel grids have made working conditions on deck dangerous especially in heavy weather. The vessel used in this project was the “Northern Eagle” owned and operated by the Osprey Fishing Company of Sydney, Nova Scotia. The vessel’s Captain is Ulf Snarby. Economics - It should be low cost. Crew Safety – It should be practical to control, and safe when shooting and hauling. Ease of Operation - No time wasting procedures. Can be wound on a net-drum if necessary. Unobtrusive – The device should readily merge with normal deck operations. No Adverse Effects on Performance - It should not reduce fishing productivity, or affect the performance of the trawl. The main objectives were to design and construct a selectivity grid with the upright separators constructed of plastic covered stainless wire. These uprights are easily replaced if required, and also have a tensioning facility. It also enabled the unit to be constructed 60% lighter and increase the safety factor. A scientific and technical protocol for the research project was prepared defining the various data collection and analysis procedures to be followed in completing the work. Meetings were held to discuss and review the implementation of the protocol prior to sailing so that all those involved in the research are aware of agreed project procedures and related activities. The shrimp Twin Trawler the “Northern Eagle” was selected from the offshore shrimp fleet and supplied with the prototype grid, which was tested against a conventional grid. 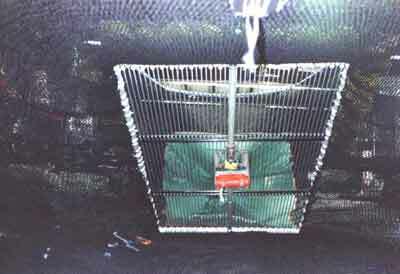 The experimental grid assembly was supplied installed in a netting section with similar dimensions to the vessel’s conventional grid. The grid was tested under commercial fishing conditions in normal fishing areas. The “Northern Eagle” is a modern stern trawler owned and operated by the Osprey Fishing Company of Sydney, Nova Scotia. The vessel’s Captain is Ulf Snarby. Built in Bergen, Norway in 1997 the vessel is 66.4 Mts. long, has a beam of 13 Mts., and is powered by a 4,200 HP engine. All shrimps are processed onboard and the vessel operates with both Single and Twin Trawls. The main winches are automatic and have a pull of 42 tons; the centre warp winch has a pull of 47 tons. Fishing is conducted all along the Labrador Sea to the median line with Greenland. Trips at present range from 25 to 35 days and fishing is conducted on a year round basis. The vessel carries a full Electronic Gear Monitoring system, which includes two Grid/Angle sensors operating simultaneously. The frame was made from special 2 x 2 x ¼ fibreglass round tubing. Frame sections were attached to one another with mechanical fasteners. The wires were 3/16 coated with nylon to a diameter of 5/16, at each end the wires are passed through a 5/8 nylon hex bolt and terminated with a swaged on button stop. The button cannot pass through the hole in the bolt. These bolts are screwed into a tapped nylon bar inside the upper and lower fibreglass tubes. Tightening the bolts puts pressure on the button stops and therefore tensions the wires. There will be about 1 inch of tightening clearance available at each end within the square tubes. Tightening can be done from either top or bottom. The bolts are staggered in length to allow accessibility with a wrench. The frame is traversed by two sets of 3/4 round fibreglass rods notched to accommodate the wires. The notches face in opposite directions so the pair prevents the wires from side to side spreading. The bars pass through holes in and are held captive by the vertical frame tubes. The wires are not tensioned to maximum this can be done if found necessary. The experimental grid was fitted with 20 x 8” floats. The experimental grid was installed at an angle of 42 degrees. The twin trawling technology requires that two trawls be towed simultaneously, one trawl had the conventional stainless steel grid, and the other had the experimental grid installed. A fishing plan based on 15 fishing days within a total period of 25 days, which included rigging and steaming time to the fishing grounds, was devised, and contained clear instructions on procedures to be followed. A meeting between all participants was held prior to the project start to familiarize the project team on the objectives and organisation. Gear geometry was recorded using Height, Distance, and Grid sensors. The operating angle of both grids was monitored by Grid sensors throughout testing to determine grid problems e.g. asymmetry. Water flow through the grids was monitored each tow. Using this data as part of the analysis, it was possible to relate changes in performance to rigging or environmental factors. Consistent with the terms of the protocol to be prepared, the Captain was given responsibility for the navigation of the ship, the safety of the crew, and the selection of commercial fishing grounds. The project officers were responsible for all other aspects of the experiment. 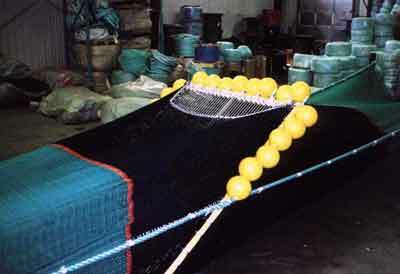 Design and construction of the experimental fishing gear. 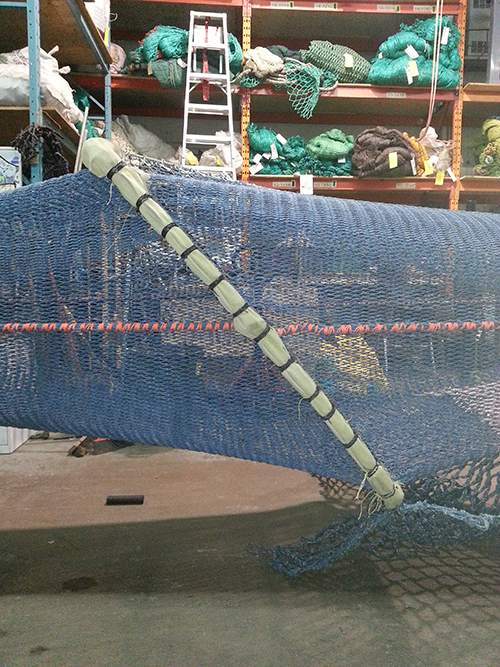 The prototype grid was tested against a stainless steel grid using the Twin Trawl system. Testing took place and 20 comparison tows were made, mostly in the Hopedale Channel off Labrador. There was an equal distribution of shrimp from both types of grids. The crew quickly noticed the difference in weight between the two grids and any twists in the prototype grid could be removed manually, whereas the winches had to be employed in a similar situation with the stainless steel grid. The grid indicated a gradual decrease in angle, which indicated reliability in identifying an increase in catch retained in the codend. Catch composition with the two grid types was identical throughout the experiment; the by-catches were the same amount and consisted of small amounts of juvenile Turbot. During one tow the catches were unequal and this was because the trawl with the experimental grid had major belly damage. The concept of new and untried materials worked in principle. A new design has to take into account that severe damage can be inflicted by large boulders. These boulders are huge; many of them have been deposited by melting icebergs on their southerly track. After 20 tows were made the trawl with the experimental grid the crossbars were damaged by a succession of large boulders. It was not possible to repair at sea and the use of the grid was discontinued. The principle of using plastic coated wires as uprights worked well during the 20 tows, the grid design concept graded shrimp efficiently. It was also rugged enough to withstand the rigours of a normal working environment on a large stern trawler. The centre bar occasionally blocked water flow readings being transmitted from the grid sensor. The wire upright adjustments were slow to complete and were difficult to equalize. The crossbars will have to be redesigned for more strength. The crew designed a semi circular shield over the grid holder, which should be incorporated in future designs. A smaller version of the present design could be used with success on smaller inshore vessels. A more rigid frame is required, possibly a double one, using similar or different materials. When a stainless steel grid is damaged or distorted, it is repaired on board. Most of the offshore shrimp vessels carry their own welding equipment. Other ways of restoring a bent stainless grid is to take it to the factory deck and place a flat surface on it, then run the forklift over it. The company based in North Sydney, Nova Scotia, operates two modern shrimp trawlers in the Canadian offshore fishery. The vessel selected for the project is one of the most modern offshore trawlers in the North Atlantic and is currently engaged in twin trawling for shrimp on the offshore fishing grounds. The Captain and crew are a highly experienced team and have a long and successful history in the industry. The vessel is equipped with modern navigational and gear monitoring equipment and had the necessary deck space and hydraulic deck equipment to conduct a project of this nature.